In the spirit of September being Heritage month, Poetry People will present their third event for 2018 at The Phansi Museum on September 22, 2018, from 10h00 running through the day until late.. Enjoy a morning of poetry, percussion by Richard Ellis, interactive art & literature discussions, books readings by authors from Botsotso and more! Tickets are R20 at the door. The event is sponsored by The Lemon Tree. Later on at 13h30 for 14h00, be sure to come and hear the Mfana Mlambo Quartet LIVE. 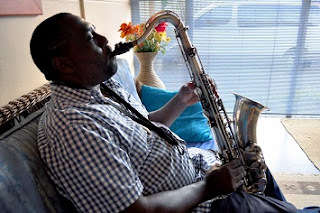 Mlambo is a locally respected composer and tenor saxophonist. He owns Sintu Productions, and has worked with internationally acclaimed South African musical artists like the late Busi Mhlongo, Sibongile Khumalo and Sankomota. You won't want to miss out on this local heavyweight. Nothing short of an amazing afternoon of jazz! Tickets R100 at the door.